Comments: White Ibises generally forage in groups, walking slowly with their heads down probing for prey with their bills. Breeding adults have red legs, black-tipped red bills and red faces. In flight, mottled brown and white young birds show a triangular white rump patch. Adults show black tips on their first four primaries. Decurved orange-red bills and reddish legs distinguish them from herons, egrets and other ibises. 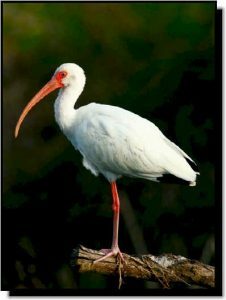 White Ibises occur in small numbers or are found only in localized sites within the Great Plains.